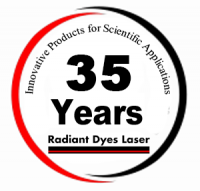 Radiant Dyes has 30 years of experience in Laser Dyes and Dye Laser development. We are the oldest existing manufacturer of tunable laser and laser accessories. "Radiant Dyes Laser Acc. GmbH" is a synonym for high quality products: dye lasers. Our dye laser "NarrowScan" has been developed further over the last years and is now the most advanced product of Radiant Dyes. Similarly Radiant Dyes kept the cw-ring and Titan-Sapphire lasers up to date. For more than 20 years, we also offer successfully, excimer lasers. Since 2009 we are selling a tunable narrowband Diode Laser with interference-filter stabilization and external cavity, our "NarrowDiode", and now also available with amplifier. With optomechanical components, such as mirror mounts, lens mounts and posts Radiant Dyes wanted to add a second string to our bow and we have developed them to absolute high-end products. We also offer a variety of laser accessories such as laser dyes, filters, dye cells, optics, dye circulators, cooling aggregates, thyratrons etc for our own laser systems and also for old Lambda Physics, Coherent, Quantel, Quanta Ray lasers and much more. Radiant Dyes gladly offers general overhauls of old laser systems (dye lers and excimer lasers), as well as laser service and training. We participate in the preparation of experiments an the equipment of laboratories, which is highly appreciated by universities and research centres worldwide. For 30 years, Radiant Dyes satisfy individual wishes to the point of series manufacturing. We are the first address for Dye Laser, Laser Accessories and Optomechanics.